005. FURTHEST SOUTH POLE. Issued by Turf Cigarettes in its "Sports Records" second series (1925). Size: 2.65" x 1.4". Recto: Colored view of Scott standing in front of a loaded sledge with 3 figures beyond and a background of ice. 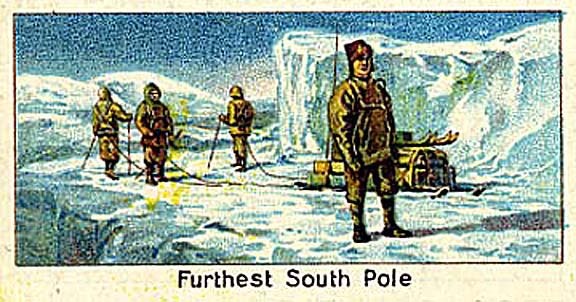 Title at bottom: Furthest South Pole. Verso: TURF | CIGARETTES | Sports Records | Second Series, Nos. 26-50 | 42. -- FURTHEST SOUTH | POLE EXPEDITION. | The pride engendered by the event in our picture is tinged with sadness. Captain R. F. Scott reached the South Pole on Jan. 8th, 1912, but the party overwhelmed in a blizzard on their return journey, and Captain Scott and his companions perished. | Alexander Boguslavsky Ltd. | 55, PICCADILLY LONDON. W.